The way I make these is a little….unorthodox, shall we say? This idea dawned on me when I read somewhere that the way restaurants make molten lava cake is to pop a frozen chocolate ganache into the batter. (Actually, I didn’t read that somewhere, I saw it in the movie “Chef” during the epic moment when Jon Favreau completely loses his cool at a restaurant critic!). So what I do is make frozen discs of Nutella. Then when I’m making the pancakes, I just plonk a disc on the batter, cover with more batter, and hey presto! You have perfect Nutella Pancakes. Line a baking tray with baking paper (parchment paper). Dollop 1½ to 2 tbsp of Nutella onto the baking tray and spread into a disc around 2½" / 6cm in diameter and ⅕" / ½ cm thick. (Note 1) Repeat to make 7 discs. Place the tray in the freezer until firm (around 1 to 1½ hours). Place the Dry Ingredients in a bowl and whisk to combine. Make a well in the centre and place the Wet Ingredients in the well. Whisk until combined and lump free (stop whisking as soon as it is smooth, don't over whisk). Dollop ¼ cup of batter into the fry pan. Working quickly, place 1 Frozen Nutella Disc in the middle of the batter, then top with batter to cover the Nutella disc (Note 4). Repeat with remaining batter. Melt more butter in the pan after the 3rd or 4th pancake. You should be able to make 7 in total, but sometimes it makes 6 - depends on how much batter you use on top of the Nutella. Serve warm with sliced strawberries, if using. You could also serve with cream but I find that it's not necessary! 1. Don't make the Nutella discs too thin otherwise they may break when you handle them. But on the other hand, don't be too greedy and make them too big otherwise they will ooze out everywhere when you're making the pancake! 2. Wiping most of the butter off is the secret to getting the first pancake an even golden brown rather than splotchy which is what usually happens! 3. The Nutella discs soften quickly. They need to stay firm in order to handle them. I work in 2 batches - take 3 Nutella discs out of the freezer, cook 3 pancakes, then repeat. I found that by the time I got to the 4th pancake, the Nutella discs were starting to soften. 4. I use a ¼ cup measure and fill it about ⅔ of the way up then dollop that on top of the Nutella. 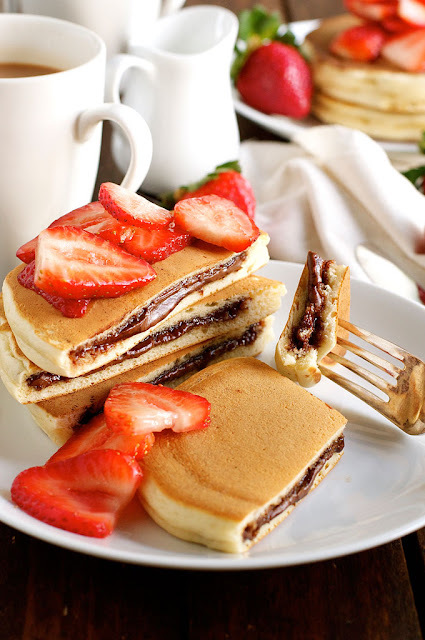 You don't need a full ¼ cup of batter to cover the Nutella, the pancake becomes too big and thick. Use the edge of the cup to spread the batter to cover the Nutella. You have to work quickly because once the Nutella disc is on the batter, it melts quickly and it is almost impossible to spread batter on top of melted Nutella. 5. If you get a pancake that "bursts" and Nutella spills onto the fry pan, scrape the Nutella off before making the next one. Otherwise you'll get burnt bits of Nutella on your next pancake!